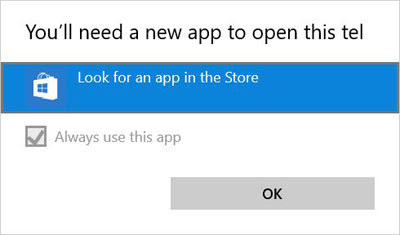 If I clicked on “Look for an app in the Store”, the App Store offered me a bunch of phone related apps, like Lync, Skype Translator, MobileVoIP, GVoice, and so on. It seems, the Edge Browser wrongly detects the hour schedule as a phone number. 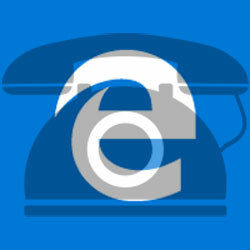 Even with real phone numbers on a page, this feature was causing issues as Edge browser was overriding the CSS styling of those phone numbers and by doing that it interferes with the design of the website. Luckily, there are few ways to solve this problem. After applying any of the solutions below, those hourly schedule information along with the styles of real telephone numbers are left alone. One way to stop the Microsoft Edge browser from creating phone number links and prevent overrides of website's CSS styling is to add the following line inside the <head> tag. We use this solution, when we want to remove this behavior all together from a webpage. This solution becomes handy, when we want to remove the styling only on elements that are not phone numbers, like in the above example, which contains a schedule. Phone numbers would keep the automatic styling as long as the viewport is smaller than 1024px, otherwise, x-ms-format-detection="none" attribute is added to every element with phone class. In the case for the schedule (first <p> on line 1), we don't want to use automatic styling at all, so we use Solution 2 to that element by adding x-ms-format-detection attribute with none value. Check the working demo of the above code on CodePen. Note: To learn more about phone number detection and how it works, check this MSDN page. Apparently, this was added in Internet Explorer 11, it was just not active in a desktop mode. If you found this article useful, take a moment to drop a comment or share it on the social networks. This article was first published in February 2016 and has been updated and republished. You pointed me in the Right direction already, thanks! Using this Meta tag disables the ability for the user to click the phone number at all. If you are building a responsive site this feature is great to have at a mobile level. I just don't want their awful styles, nor do I want it at desktop level. Any suggestions? Great it works, thank you!!! Your solutions address only specific pages. As a user, I want to disable this function in my Edge browser, for all pages. Do you know how to do it? Thanks! There seems to be an Administrative Template Policy Settings for this option, check this link for IE11. I wasn't able to try it on my Win7 Home, since you can only edit Group Policy with Professional Edition of Windows. For anyone implementing the JS version... the function must load and execute BEFORE the DOM finishes loading. I couldn't work out why the class wasn't changed when the condition was TRUE; then found a note on MS-MSDN page reminding 'us' to run the code before "parent is rendered in the DOM as dynamic changes are not supported". In plain language this means load in header without document.ready function. Perfect solution and very well explained. Thank you.